This was posted on another one of my other sites back in 2011, it’s been fairly popular, and thanks to GoPro being sensible and keeping their mounts the same over the last few years it’s sill relevant to readers of this site. 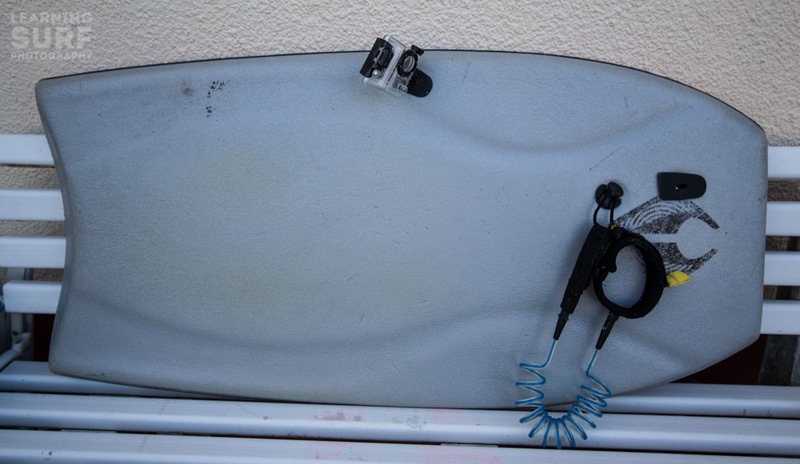 I’ve been getting a few questions about the board-cam I made for my GoPro camera, I’ve experimented with a few mounting options for the GoPro on my bodyboard, trying to get away from the standard helmet-cam view which can suffer from a lack of scale and a disembodied feeling. The simplest and probably most successful mount I’ve made so far places the camera on the outside rail of the board and puts the nose in centre frame, the rider at the side and the wave hopefully surrounding the lot. I’ve used a couple of variations on the design now and have settled on a design which will now be a part of all my new boards. FCS softboard fin mount kit (not readily available but ask your nearest FCS stockist to order some: http://www.surffcs.com/en/technology/systems/softboard.aspx). Once you’ve got your FCS softboard mounts you’ll notice that the side fin mounts have a cant or angle built in, we don’t want this so use the centre softboard fin mount which is vertical, FCS fins have two tabs but we only need one for the camera so saw the mount in half and round off the edges with a file so you’ll have two mounts. You’ll probably need to cut a bit of the threaded screw part of the mount off so it will give you a tight fit on your board, they make them a bit longer than a standard bodyboard leash plug to fit through those thick foamie stand-up boards. 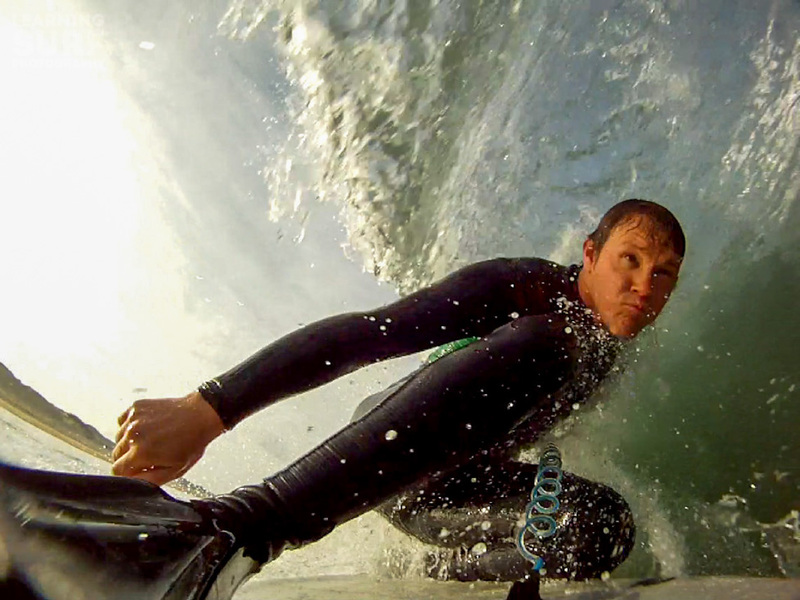 I chose to put one near the nose for filming looking back, I mostly use this when I’m drop-kneeing, and the other on the left hand rail as the hollow waves I surf tend to be rights. Positioning is up to you, I’d recommend laying on your board in trim position and then sticking it a few inches forward of your outside hand, you want it as far back as possible without it getting in the way, (if you’re worried about putting it too far back watch some footage of Pierre Louis Costes bodyboarding and check out how far back his outside hand is). I angled mine in a bit to make sure the nose of the board is in the middle of the shot, I use the 960p (r4 on the GoPro HD 2) setting to record with the most vertical resolution in case the angle wasn’t just right, but I might change that to the 60fps 720p mode now I’ve got it how I want it. Here’s a picture of the mount on the board to give you an idea of where I put it, you can see the other mount near the nose, the FCS plug mount is held in place with a small grub screw so you can easily remove the camera housing and leave a flat surface if you don’t want to use the camera. There’s plenty of other options for mounting the awesome little GoPro camera but this one’s simple, easy to set-up and remove and can give you some really nice angles.